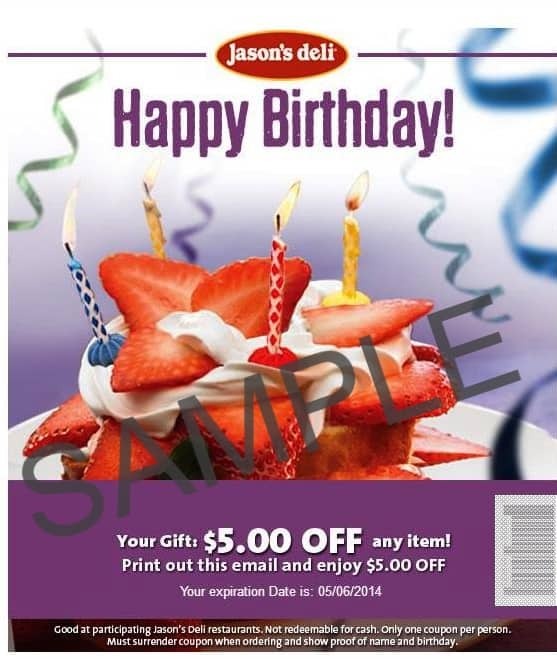 How to Get Free Food on Your Birthday | Saving the Crumbs Yes, even the name is alluring. isn’t it? Hey, It’s Free! posts freebies such as free samples, free promotions, and free giveaways. But it also has a page that lists over 140 stores (mainly restaurants) that give you free stuff on your birthday, from buy one get one free, to $5 off your next purchase, to free burritos, burgers, and ice cream. They make it very convenient in that they list for you what freebie you get and link you directly to the restaurant’s signup webpage. Not every freebie is as fully free as you may think, so you do have to spend some time combing through the list to find the best deals. For example, if you have to spend $6 buying the 1st entrée to get the 2nd entrée free, but you never would have bought the 1st entrée in the first place, you haven’t gotten anything free. You’ve just been schemed into spending money that should have stayed in your pocket. However, a free Red Robin burger with no purchase necessary – just walk in, give them your order, and walk out with free food – sounds like a pretty good birthday gift to me. Search your locality – Not all the restaurants will have franchises near you. Do a quick search online to find the ones in your area. 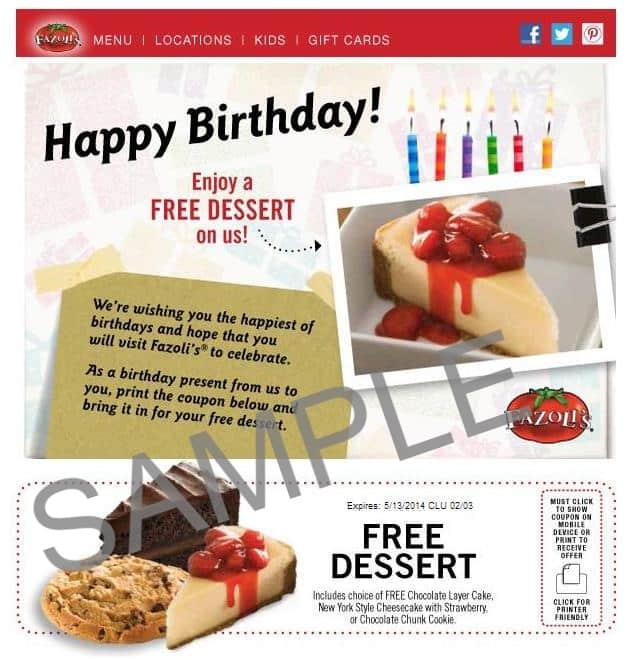 Sign up early – Many of the birthday freebie programs won’t email you your free stuff if you sign up too close to your birthday. So try to sign up at least 1 month before your birthdate. Expect email marketing – The whole reason that restaurants give you free stuff is to: 1) get you into their store, 2) lure you into trying something you wouldn’t have tried otherwise, and 3) procure your contact information so they can send you their marketing material. If you have a separate email address for your “junk” emails, you can sign up with that one. But remember, this is where your freebies will be sent, so don’t forget about it or accidentally delete your deals with all the other junk mail! Read the fine print – It’s impossible to go over each scenario, but just make sure and read the fine print carefully. Some say “dine-in only” (which means you’ll usually end up buying more for whoever else comes with you), “buy one, get the second free” (which means your bill is really only 50% off, not free), or “free entrée with purchase of a drink” (this has to be weighed, as sometimes the value of the entrée is worth a $2 drink). Because we otherwise would not eat out, we usually only go with the ones where the food is “truly” free or pretty close to it. If you plan on eating out anyway, more power to you, you’ll have more deals than you’ll need! *Al wanted me to make sure and mention that we didn’t eat all this food at once. We split it up into 2 weekend outings so we both got free lunch twice. So, does getting free food on your birthday sound good to you? These are only a few of the birthday freebies that we happen to like best in our area. Your area may have a lot of restaurants besides these or you may know of some that we would love to hear about. Share them with us in the comment section and tell us about your birthday freebie experience. You guys need to try Provino’s! Free entree and unlimited salad and garlic bread on your birthday!! I think Genghis Grill also gives a free meal on your birthday! !